Elaine Thomas ’76 is a pioneer in her field, but she still is doing what generations of women have done in more traditional roles—bake. She just happens to do her cooking at 3,000 degrees—with carbon and alloy steels as her ingredients. The first woman to graduate from Washington State University with a degree in metallurgy, Thomas also recently became the first woman to receive the Steel Founders’ Society of America’s (SFSA) Charles W. Briggs Memorial Technical & Operating Medal for her career contributions in the field of metallurgy. The award includes a scholarship donation, which Thomas gave to WSU. When she came to WSU, Thomas initially planned on being a music major. After returning home from college after her freshman year, she spent some time with a neighbor, who was chief metallurgist for the Boeing company and who encouraged her to pursue metallurgy. Chemistry and math came easily to her—she was at the top of her class in high school—and Thomas liked the subjects. She considered several engineering fields but settled on metallurgy and changed her major that fall. Her metallurgy major only included four students, and they struggled through their difficult classes together. She sometimes studied with the handful of women who were taking engineering and science classes at that time. Her professors, including Servet Duran and Bruce Masson, were supportive of her efforts. Shortly after graduation, she went to work at Battelle before joining Atlas Foundry. The Tacoma-based company, which later became part of Bradken, makes high quality, high-specification parts for energy producers. According to her nominators, Thomas is a top metallurgist in the steel casting industry, where she developed procedures and processes for sophisticated steel castings. 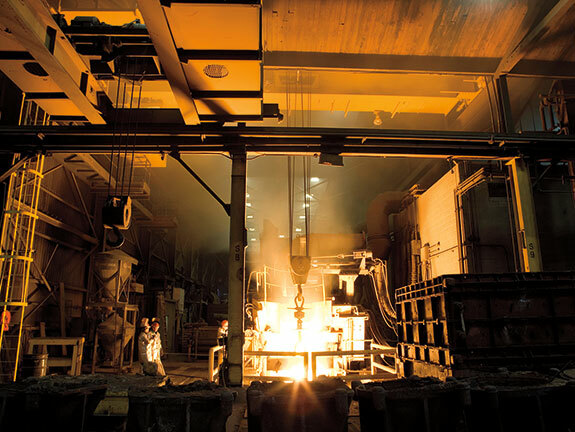 Bradken-Tacoma is one of the few foundries in the world that is qualified to make metal castings for nuclear facilities. There, again, she was often the only woman on the job site. Recently, in fact, she found her application letter for Atlas. It said, “No G,” meaning no girls, on the letter. But Duran, her WSU advisor, called the person who was doing the hiring and strongly encouraged him to hire Thomas. Over the years, the worksite wasn’t always friendly to women, and Thomas suffered plenty of harassment in the male-dominated world. Looking back, many instances were not acceptable, she says. Sometimes she literally trembled when she confronted discrimination as she worked at her job. But she also had many wonderful cohorts who looked after her, says Thomas. These days Thomas enjoys mentoring students and has seen the number of women in materials engineering grow. “Hopefully, I have made it better for them, so they can inherit a freer path,” she says. In her job, Thomas works primarily with the melt shop and heat-treating operations as well as managing the chemistry and mechanical testing labs. She has also worked as a welding engineer. The work that she has done to modify specs and design procedures for high performance metals is used around the world. Her work led to the Brigg’s medal from SFSA, which is almost entirely made up of men. She says she feels privileged to have worked with the top people in materials engineering in the world. She’s looking forward to letting a scholarship provide support and guidance for the next generation of young men and women.